Potbelly reported weak results to end 2013, which further proves that there is no guarantees for companies labeled "the next Chipotle." In One Up On Wall Street, famed investor Peter Lynch labels "I missed that one, I'll catch the next one" as one of the "the twelve silliest (and most dangerous) things people say about stock prices" because "the trouble is, the 'next' one rarely works..."
Potbelly and fellow high-growth potential darling Noodles & Company (NASDAQ:NDLS) have lost value simply because the growth expectations placed on both companies were not realistic. Meanwhile, Chipotle Mexican Grill (NYSE:CMG) continues to outperform as a result of the simple fact that its concept, execution, and management are superior to its peers. Sources: Potbelly prospectus filed October 4, 2013 and Potbelly fourth quarter earnings release. It is worth reemphasizing the data in the chart above: Potbelly has reported double-digit revenue growth and SSS growth of more than 2% in just one of the past five years. In contrast, Chipotle reported revenue growth of 20.7% and SSS growth of 9% in the most recent quarter. So, why were investors ever thinking that Potbelly would keep pace with Chipotle? Quite simply, "potential" is often overused in the creation of an investment thesis. While Panera Bread (NASDAQ:PNRA.DL) has been criticized for blaming weather on its fourth quarter results, the company still managed to report stronger growth than Potbelly. Panera's fourth quarter revenues grew 16% and SSS grew 1.7%. Panera also reported 12% earnings growth, a notable difference from Potbelly's swing to a net loss. Interestingly, Panera trades at a forward price-to-earnings ratio of 22, half that of Potbelly's forward ratio of 44. What has Potbelly done to deserve double the growth premium of Panera? Both Chipotle and Panera have reached roughly half the likely saturation point for domestic locations. This still provides plenty of growth by doubling the number of current locations without even factoring in international opportunities. In addition to location expansion, both Panera and Chipotle are investing to drive further SSS growth. This can be simple ideas like menu expansion such as Chipotle's sofrita roll out, but it can be far more subtle. Both Chipotle and Panera are aiming to increase throughput through investment in technology; these investments include mobile payments, touch screen ordering kiosks, and other ways to speed the alway quick service that they can deliver. There is definite opportunity in the fact that Potbelly has just 319 locations. However, the company has not proven that it can reliably grow revenue or earnings. 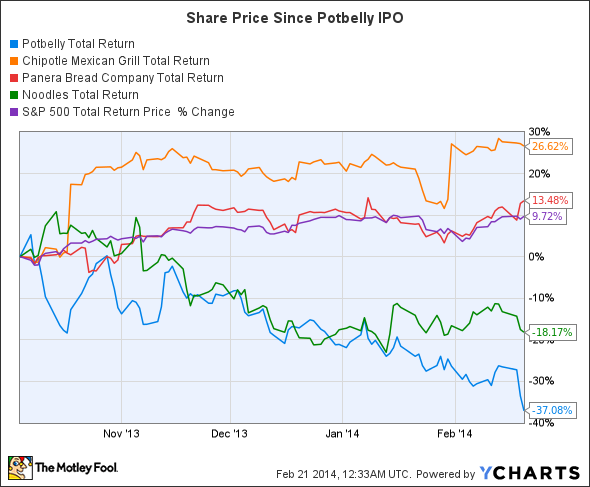 Even after the recent decline in share price to all-time lows, Potbelly's valuation still does not make sense. Panera has and will continue to deliver reliable growth at a reasonable valuation. Chipotle has and will continue to deliver exceptional growth at a higher valuation (forward P/E ratio of 34). Both companies have a history of delivering strong growth and have provided investors with very little reason to doubt that this growth will continue for the foreseeable future. As noted previously, Potbelly has neither consistently delivered excellent results nor given sufficient reason to be confident in future growth. With that in context, why speculate on Potbelly and pay a higher earnings multiple despite no proven track record and higher forward-looking risk that "potential growth" will not materialize? Meanwhile, analysts continue to expect Chipotle to generate growth in excess of 20% per year at a rate similar to growth expectations for Potbelly. Chipotle's shares may seem expensive, but at least the company's performance has earned a premium valuation; the same can't be said for Potbelly.